Ottawa, August 28, 2015 - The food recall warning issued on August 7, 2015 has been updated to include additional product information. This additional information was identified during the Canadian Food Inspection Agency's (CFIA) food safety investigation. 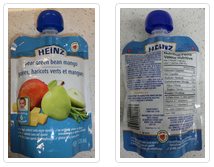 Heinz Canada is recalling Heinz brand Pear Green Bean Mango from the marketplace due to potential loss of seal, causing spoilage. Consumers should not consume the recalled product described.